Your trip to Corfu can be with a ferry boat. If you select to visit Corfu from the port of Igoumenitsa to Lefkimmi port, your trip will take about 1 hour while to the port of Corfu (Corfu center-port) about 1 hour and 45 minutes. Lefkimmi Ferries from Igoumenitsa to Corfu & Corfu to Igoumenitsa, run all year round on a daily basis. In summer season there are more departures to choose from. 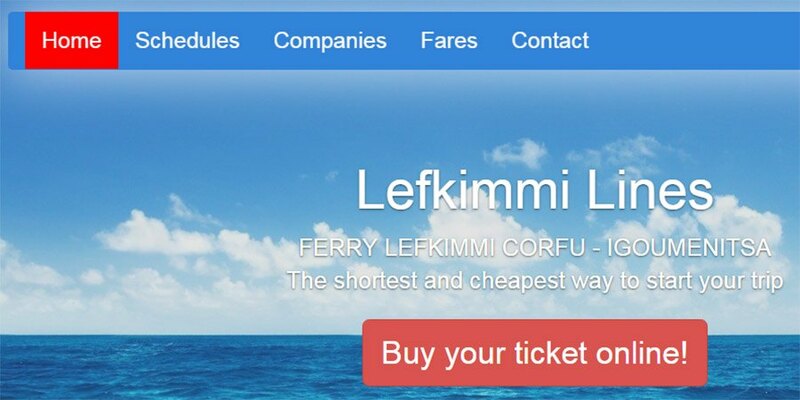 You can now book ferry tickets online for Corfu Island via “Lefkimmi Lines” .If you plan to travel during the months,June,July August and September it’s best if you have Booked Online several days or weeks earlier to avoid hitches. You should also know that “Lefkimmi Lines” tickets come with a considerable discount. Ferry tickets and offers to Corfu. Search all the ferry itineraries and cheap tickets for Corfu Island at “Lefkimmi Lines” website. Online Ferry tickets at the best prices, search for the special offers, from Igoumenitsa to Corfu and back.